This is the Booklikes Companion to Diaries of 2 Thick Chicks Blog created by two crazy friends Nettie and Celie. Reviewing Books, Talking Hot Topics, and Other Random Stuff! 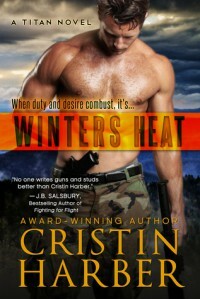 Winters Heat is a GREAT start to a new Romantic Suspense series! Little did I know when I choose this book from Net Galley that I would find my new obsession in a book series. Now I have to run out and purchase the other books in the series. Cristin Harber delivers the most promising romantic suspense series since I discovered the KGI series by Maya Banks! Colby Winters is a man of many faces....a solider, a son, a lover of woman, and a deadly operative. A member of the elite military squad Titan, Colby has no idea that his latest mission will lead to life altering changes for his future. While on a mission to acquire a top secret package from a drop spot inside the airport, Colby encounters the beautiful Mia Kensington, but there's one major problem....she has her hands on his package! Mia Kensington is a military psychologist who's latest patient just turned up dead of an apparent suicide. During her last session with her client, he informs Mia that should something happen to him, she should get to the airport and retrieve a package containing top secret information. Mia has no idea that she just made herself a target of a psychotic killer intent on getting his hands on the information she has in her possession. Running for her life and not knowing who to trust, Mia finds herself in the arms of a beautiful man. Can she trust him? Should she trust him with her life? Read the book and find out!!!! Winters Heat kept me guessing and on pins and needles throughout the entire book! Cristin Harber took the average cliche character and made him into a unique individual. Colby Winters is keeping a secret that will just melt the heart of any woman. He down right dirty and deadly but he has an unexpected sensitive side that caught me by surprise. Mia as a heroine was awesome! I loved her strength and how she used her passion and love for Colby to drive his team members crazy! I'm totally looking forward to the next book in the series which features Garrison. If you loved the KGI series by Maya Banks, you will absolutely LOVE the Titan Series by Cristin Harber. I'm giving this one 4 Notes and 5 Flames!